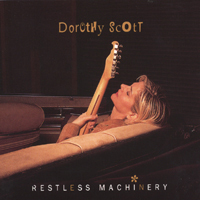 Dorothy Scott one of those voices that when you hear her, depending on if you’re familiar with her sound, you either say, “oh it’s obviously Dorothy Scott” or “Wow, who is this?”. By that I mean you probably won’t mistake her for anyone else. It’s quite unique. That being said there are times when she reminds me of Heather Nova. It’s not often or even obvious, but after listening to the first track “Julie” I found that I had Nova’s “Winterblue” song in my head. It’s so nice to hear something unexpected. From the cover of the CD I expected slightly jazzy, sophisticated (maybe a little uppity) AAA. But when I got instead is indescribable pop, rock, folk, combo with a jazzy feel. Not uppity at all, but still sophisticated in that it’s well written and expertly performed. Give this one a listen, you won’t regret it. Comment: I am awestruck with Dorothy’s music. I especially love the freedom Dorothy expresses in her music. She reminds me quite a bit of the late Jeff Buckley. Dorothy uses her voice as an instrument! My favorite songs are “Waterboy” “Heartbeat” and “Down Into The River” If anyone gets a chance to see her live..I encourage you to do so! Her performance at the Door Community Auditorium was Outstanding!